The race was held last Sunday, 15th May 2011 and the participations was BIG !!!. 80 cyclists registered for the event – 16 teams. It was record breaking. It means that a lot of local cyclists are taking up road race as one of their enjoyment of pleasure, not just bicycle expedition. As predicted, less than half finish the race because some of the cyclists didn’t have enough time to train because the race was announce 2 weeks before the event. Banyaklah yang berjuritan di highway bertinggalan termasuk akulah…………. Group photo before the race. The 5th member (Centre) is our National rider – Faizal Hj Ahmad to strengthen our Team. The categories of the race are individual race and group race. For group race, only 3 cyclists needed to finish the race to score the total fastest time. GOOD LUCK TEAMS. ENJOY AND SAFETY FIRST. During the managers meeting the day earlier, everyone requested for a rolling start or more precisely controlled speed. So it was agreed that the ‘Com 1 Car’ will be in front controlling the speed at 30km/h and after 5.5km which is near /under the Tiong Hin Round-About bridge, the Com 1 Car will speed off and the race will start. After the 5.5km, the speed increases tremendously – 45km/h and above and my heart rate was way above max. It was difficult just to stay in the peloton. I was left behind somewhere after the Blue Lake Police Booth. That was around 40km. They keep on doing interval which I cannot keep up. First there was 4 of us and then another group of 5 or 6 cyclists managed to catch us from the back and we become a group of cyclists who are determine to finish the race and giving up is not an option. The only problem with this group is that we are not really trying to catch up with the peloton. We are just maintaining our speed 30 to 37km/h. We don’t want to quit but at the same time don’t want to catch the peloton. If we had tried to reduce the gap and time difference, a lot of us would have managed to finish within the 30 minutes cut off time. Well most of us are just newbie, beginners, inexperience racers. If we work together as a team, that would work. My recorded time using Garmin and the transponder is the same. Just look at that average speed 32.8km/h – This is what you call ‘speed makan angin’. Very Poor. 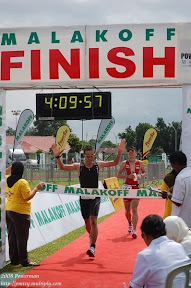 Faizal, Zaeidi and then Reza managed to finish within the 30 minutes cut-off time after the 1st finisher. Reza has only 3 minutes before the time was stop. After 30 minutes, those finishers will be considered Did Not Finish (DNF). So after Reza, there were 14 cyclists who managed to finish the race but was considered DNF. I was 39 minutes behind the 1st cyclist. Argghh…… the frustration. Official results, My team – Anakpanyu Cycling Team got 7th place for the group categories. Out of 16 groups, only 8 teams managed to finish the race. Bicycle race is much more difficult and frustrating compared to running a race. In cycling, you need to join group cycling if you need to build up endurance, speed and strength. Training individually will only help you very very very little. During a race you need to stay with the main peloton and if you ever got drop and fall behind, it will be very difficult for you join back the peloton and there the time gap that you have to watch out. If you’re time gap between the peloton and you are more than the allocated time, then you are required to stop – DNF. See how difficult is the race. For running, your long run should be around 1 to 2.5 hours (10km to 26km) for a 21km event. For cycling, long ride should be between 3 to 5 hours which is around 90km to 160km. For me, I need to improve in my speed and interval. I got tired easily if it is speed interval. Maintaining constant high speed I can do it, but interval, that would just drain my energy out. Coming up is another road race for Novice riders in June. So this time no Elite/National riders will be participating. No date has been set but most probably it would be 26th June 2011. Distance is less than 100km, probably 80km. So to all racers out there, you still have time to train since it is more than a month way and it is a shorter distance. Cheers for the tips and sharing your experience and I enjoy reading your posts. I just started running not too long back (4 months). Mainly to loose weight and to get fit. Now I know what a long run is.... been trying to figure that one out.